Suzan-Lori Parks’ post-modern urban re-envisioning of Nathaniel Hawthorne’s The Scarlet Letter, IN THE BLOOD addresses the theme of destiny, the tragedy of poverty, and the societal need for compassion in a provocative in-your-face production at Norristown’s Theatre Horizon. 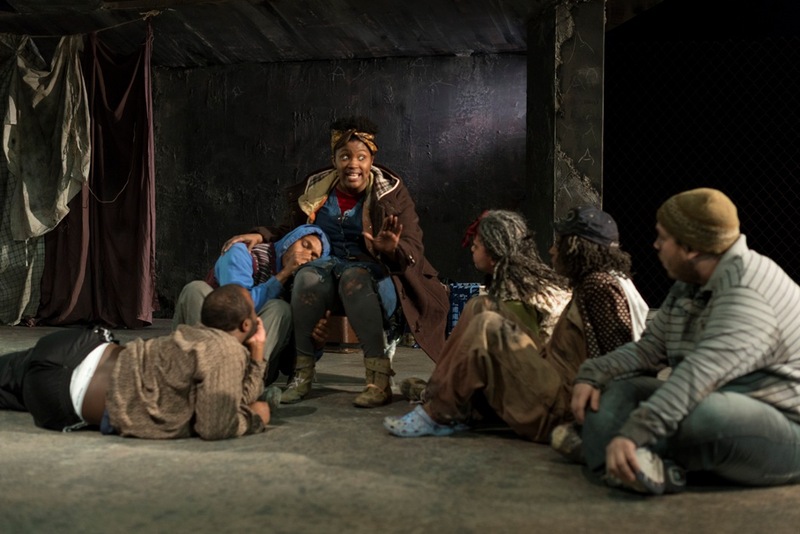 Mixing satire with gravity and street talk with poetry, the Pulitzer-Prize-winning playwright follows her new Hester’s struggles against sexual exploitation, illiteracy, unemployment, homelessness, and hunger, as the unwed mother of five is confronted with the disdain of a jaded community and the failures of a broken system. Will the hand of fate release its stranglehold on her, or are the circumstances of her life inherent in her blood, and written in the blood of her children? Directed by Pirronne Yousefzadeh, the dark sardonic humor of the play is embodied in the outrageous hyperbolized behavior of the haters, users, and abusers (Akeem Davis, Christina May, Forrest McClendon, Sam Sherburne, and Cathy Simpson, each delivering a chilling spotlighted “confession” and unsettling verbal attacks en masse) that Hester (the heart-wrenching Ashley Everage) encounters in her quest for redemption, her determination to keep her family together, and her hopes of getting “a leg up” so that she can offer a better future to her five young “treasures” than their current subsistence under a bridge (the kids are also played by the versatile ensemble, with childlike spirit and relatable familial tenderness and tension). 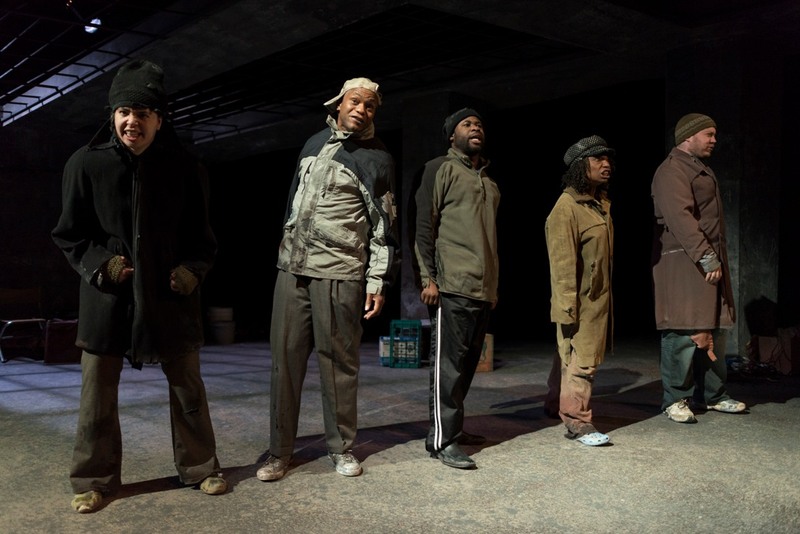 Horizon’s design team vividly creates a gritty environment for the protagonists to inhabit, with a realistic set (Brian Dudkiewicz) that fabricates their makeshift vagrant home beneath a concrete and steel overpass, furnished with the detritus they pulled from city streets and dumpsters (props by Amanda Hatch), in torn and filthy rags (costumes by Janus Stefanowicz) that contrast with the professional attire of their antagonists. The darkness of their situation is reflected in Cecilia Durbin’s dramatic lighting, and Larry Fowler’s clear sound design renders every vicious epithet and angry insult hurled at them easy to hear but hard to listen to.